I get it, you're tired of hearing about RGIII right? Or at least that's what you say out loud. Every time something comes up that involves the former Redskins' quarterback that broke an entire fan base's hearts, that's what people say. It's all a complete lie though. Look I get it, it's the Lavar Ball fatigue. No one wants to see his name, but we still click. We're still curious. Robert Griffin III is the same way for Redskins fans. We want to forget the heartbreak, but we still click on our ex's pictures on Facebook just to see what they're up to. We thought he was The One. He wasn't. So Monday, Santana Moss said on Chad Dukes vs. The World that Griffin celebrated when Mike Shanahan was fired. RGII denied it, and went on a Twitter rampage. Next year coach wants out, says he wants out, says he never wanted me as his QB & I GET BLAMED? C'mon man. I have been the good soldier. Some so desperately want me to fit this negative narrative that has been pushed about me. But I don't fit it. Never have. Never will. Now, it's everywhere, from SportsCenter to NFL Network. Obviously, when you're an athlete and you respond like this on social media, you only fan the flames. Redskins fans collectively rolled their eyes and brought out the usual narrative that "we don't care about RGII anymore". We all do, and we always will. Redskins fans will always look back at 2012, and the belief that we finally found the guy that would take this organization out of the swamp of dysfunction. When it didn't happen, it stung, whether we want to admit it or not. It doesn't matter that it was five years ago. It doesn't matter that Griffin is already out of the league. What matters is what COULD have been, and what isn't. It's time we just accept that fact that the short-lived "RGIII is our savior" era will always stick in the back of our minds. That's what being a fan is. You deal with the let downs, find a way to be optimistic, even if it's blind, and hope that the future will bring something more. We can pretend we've moved past what could have been. We can pretend that we don't care anymore, and stuff our feelings deep, deep down inside. But in the end, we're still clicking, checking up, and wondering what he's up to. 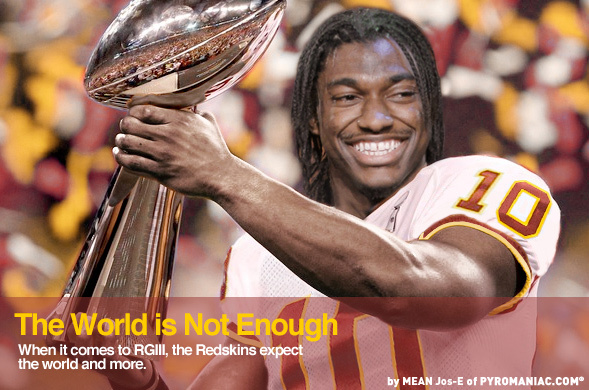 The rise and fall of RGIII is so dramatic, DC will always gravitate to the topic. It's such a drastic drop off, that we'll never be able to forget. Welcome to being a fan of the Redskins.